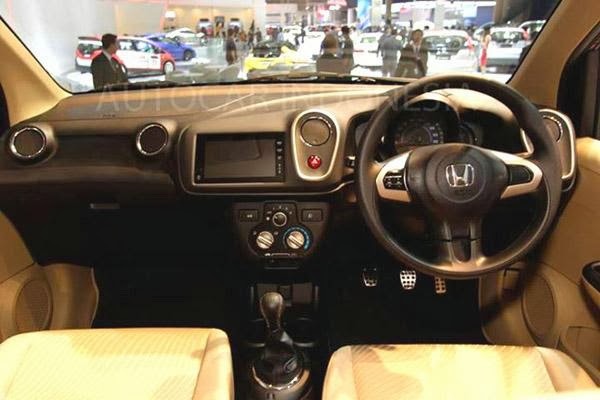 Honda's Mobilio MPV was unveiled first during 2013 Indonesian Motor Show and was announced for a launch next year. The Indian launch could happen around the festive season in 2014. As the Japanese auto maker make these announcements, here we are with the first ever spy images of the car. The Mobilio MPV seen here is a silver painted car and is a top spec version, called as "E" in Indonesia. The Mobilio MPV in India will be fitted with 1.5L Earthdreams Diesel engine and a 1.5L i-VTEC engine. Indonesian prices for the Mobilio range from 150-180 million Indonesian Rupiah (INR 8.41 lakhs to INR 10.09 lakhs). The direct competitor for Mobilio would be Maruti Suzuki Ertiga which has recently achieved 100,000 units of sales in domestic market in just 17 months. You could also get a CVT gearbox for Mobilio once this is launched during next year. From the front the car looks much similar to Brio however once you start gazing the car from the sides, you feel the aggressive look the car has got due to the side profile which has curves across its body. The Mobilio gets a larger front grille with a more prominent chrome bar running along the centre. The bumper gets a new faux air dam at the bottom while the fog lamps remain the same as those on the Brio. The flared arch wheels gives it a macho feel while the tweaked rear window near D pillar gives it a longer longer or visually longer appeal. The wheelbase of the Mobilio has been stretched over the Brio’s to make way for more cabin space and its three rows of seating. The Mobilio is 4.4m long, 1.68m wide, 1.61m tall with a wheelbase measuring 2.65m long and a class-leading ground clearance of 185mm. It would directly compete with Maruti Suzuki's Ertiga. Stay tuned for more information here at Wheel-O-Mania. Watch out for more information here.